First in our list of campsites and located close to Bantry is Eagle Point. This campsite boasts stunning cliff-side views, pebble beaches, rock pools and an onsite slipway for boats right on its doorstep. It is the ideal spot for water-based activities like boating, wind surfing, swimming and fishing. There is a supermarket and petrol station at the entrance to the park. For fun, apart from the water-based activities, you can find a tennis court, football pitch, basketball court, small playground and a TV room for entertainment. Within the surrounding 10km are golf courses, National walkways, forests, shops, restaurants, craft shops and so much more. Not to mention all that can be discovered in South Kerry and West Cork from this relaxing base in Ballickey, Bantry. Bundoran is a popular tourist spot and a surfer’s paradise for all water sports enthusiasts! Situated within walking distance to shops, restaurants, cinema, bowling alley, amusements, water world and beaches, there is something for everybody! The campsite is family friendly with electric/water and a picnic bench at each stand! This campsite is in a great location if you plan on exploring the North Antrim Coast, located just minutes from the Giant’s Causeway and the Old Bushmill’s Distillery. It is a quiet, peaceful and secure place just outside the busy town of Bushmills. It has spacious pitches and a children’s play area. A great starting point or stopover to add to the list when planning your Causeway Coastal Route! Set at the foot of Mount Brandon, overlooking Brandon Bay in beautiful Cloghane, this hidden gem is in a superb location! Perfect to stop off while exploring the Dingle Way, with great food, scenic views and plenty of great walks to be enjoyed from here. Just a 20-minute drive from Dingle town and a variety of activities available such as fishing, water sports and whale watching. Set in a convenient location close to Belfast city. A ten-minute coastal drive takes you from the city out to this Lough side location. The site is well laid out offering great views over the Lough. From here you can follow the cycle path which takes you right into Belfast city or there is a bus stop close by which will also take you into the city. There is a café and playground adjacent to the park with shops, restaurants and pubs just a few minutes’ walk away. A short distance from Mizen Head, Ireland’s most south westerly point this campsite has great facilities including a mini market, takeaway, laundrette, tennis courts, basketball court, pitch and putt course, children’s playground and an indoor games room! If that’s not enough to keep you entertained there are plenty of activities to be enjoyed. Bicycle hire, water sports, fishing not to mention all the gorgeous beaches nearby! Another great campsite in Co. Donegal. With Knockalla mountains on one side and Ballymastocker Bay on the other, the surrounding scenery is beautiful. There is an outdoor play area, tennis court, football pitch and a shop which sells tea/coffee, homemade baked goods and ice cream. Only a ten-minute walk from the beach and with plenty of hiking and walking in the vicinity it is a great place to unwind and relax. Based only ten minutes from Tralee on the gateway to the Dingle Peninsula, Woodlands Park is family friendly and a great base to explore the Ring of Kerry, Lakes of Killarney or any of the many golden beaches nearby. The Aqua Dome, Irelands largest indoor water park, Kerry County Museum, Tralee Bay Wetlands Centre, cinema and golf also nearby. The award-winning campsite has plenty for you to do with a playground, indoor playroom, football pitch and all-weather BBQ onsite. This beautiful campsite surrounded by a forest is a little piece of paradise situated near the village of Adare. With a café onsite and ample walking/cycling routes you could happily spend your trip exploring the campsite and its surrounding areas, the playgrounds or the ruins of the De Vere Family Mansion. 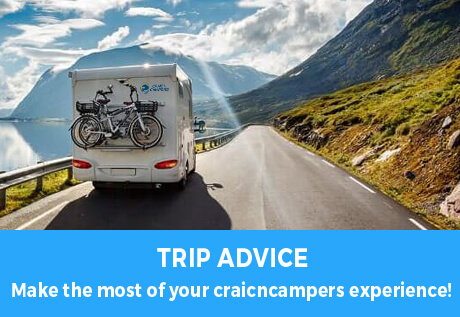 Pitches are spacious and well placed making this the perfect stop when exploring the Mid-West of Ireland. Another spacious award-winning campsite in Bushmills, Co. Antrim close to the Giant’s Causeway, Carrick-a-rede rope bridge and Bushmills Distillery. Onsite there is a shop, outdoor playpark and football field, indoor games room, TV area and wildlife ponds to explore. Nearby there are shops, cafes and restaurants and there are also plenty of day trips to book from the park with a bus service collecting you from the campsite.